Quick Notice: I've made a form to try and see what viewers want out of this blog. There's a link to it below, but just in case you're in a hurry you can click here to get to it as well. I haven't been as productive with personal projects as in years past, but many things happened ion my life. The biggest two events were the completion of my College Capstone (and my subsequent graduation from Champlain College), and moving to Quebec for a new job. I'm happy with how life is going but these two events disrupted things quite a bit, and I've only just started falling back into a normal routine. This year, I finally put the DFEngine project to rest, and tried a new approach with DFGame. For the most part, I think it has been a success! DFEngine's two greatest sins, in my opinion, were being difficult for new projects and being woefully inflexible, both of which are fixed by its successor. Of course, nothing is without its faults. 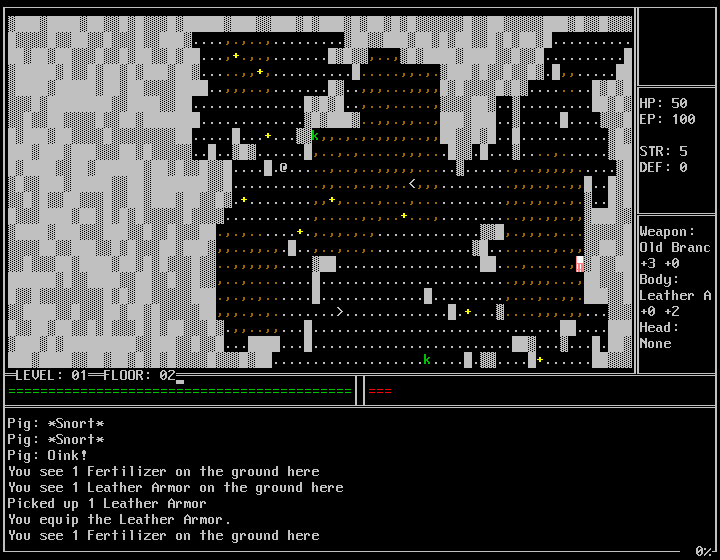 As of a few days ago, I started refactoring/rewriting parts of DFGame. I don't plan on throwing everything away, but I'm hoping to make the codebase cleaner and better commented, while also filling much-needed holes in the API. My projects are still awaiting an official OK from on high though, so I'll hold off on discussing the changes until later. The Singularity rewrite is still going. I haven't been working too hard on it recently, but it certainly feels more polished than before. With any luck, it'll be wrapped up and released some time in the next 6 months. Like the previous two years, I gave 7drl a shot. However, this year's entry didn't really go so well. I finished the game, but it isn't very fun to play. Honestly, I think my head just wasn't in the game this year. Here's to hoping that next year goes better! So, this year wasn't too impressive. I think it was just a fluke, though. I wasn't programming much when the job started, but now I'm slowly getting back to my old ways and I think the restarted roguelike series is going to help as well. I have a few goals for next year: Release Singularity 0.3, finish the DFGame rework and get started on a larger game project. However, the biggest change that I want to see is an improvement to this blog's quality. I want to see the content of this blog evolve from the old "Update!" posts into something more interesting, informative, and directed. To that end, I've made a form to let you provide your input. I want to know what you'd like to see out of a blog like mine, and I'll use that feedback going forward. To access the form, click here. This is very important, so please take the few minutes out of your day to fill it out.